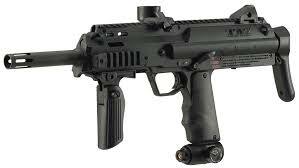 eople who is thinking about taking up paintball full time you will want to choose your first gun carefully. Many people get into paintball by accident, going out to a field with a group for a bachelor party, a staff outing, or just at the invitation of a friend. Everyone quickly realizes how addicting the sport can be, and most will be chomping at the bit to get back out there. These first outings can be a great way to get an idea of the type of gun that you want to purchase. Most outfitters will rent out standard, cheap-yet-durable pump model guns. These guns are designed with a pump action which is pulled backwards to drop a ball in front of the bolt and then pushed forward to place the paintball in front of the bolt in firing position. Right off, you will realize that in the excitement of paintball war, pump model guns get jammed up as you forget if you have put a ball in the chamber or not. Players are especially prone to this in high-intensity situations where they are firing for their life (and they usually end up getting shot out sometime during the frenzy). Pump guns can be great for beginners, but it is likely that on your first few outings you will be impressed by the types of guns other players bring to the field. I remember the second time I went out. We were a team of pump-armed teenagers and the other team had a guy with a semi-automatic. We were mowed down time and time again, because of high firing speed and the lack of confusion on the part of the other gunner. If you are planning on becoming involved in high-intensity games, then a semi might be the best model for you. Just remember that as semi automatics are becoming more prevalent, many field operators are aware of the damage to business; if paintball becomes a sport of professionals only, then the market for beginners will dry up. Many paintball fields cater to amateurs and thus will only allow pumps on their ranges unless they are hosting a special tournament. Pump guns are still a great way to demonstrate mastery in the game as they require real skill to manage. Your first gun will also be determined by whether or not you plan to join a paintball team. Often, team hobbyists will have several roles for individuals to play, and the type of gun will depend on the role that you are playing. Full automatics are good for holding positions and laying down covering fire, pumps are used by snipers and the real skilled players on the team, and ramping modes shoot huge bursts per second and are a good counter to automatics. The decision about what type of gun you use will be based on a lot of factors. Many enthusiasts will use several types of gun depending on what type of event they are participating. Your first gun is special, though, as it will determine the direction you will take with your new hobby. Choose wisely, and have fun!